No bowler in the history of the game has succeeded against every batsman he bowled to. The vice-versa is also equally true. When it comes to the late 90s and early 2000s, even the great bowlers like Curtly Ambrose, Shane Warne, Glenn McGrath, Courtney Walsh, Muttiah Muralitharan, Waqar Younis, Brett Lee, and Shoaib Akhtar had a nemesis or two during their playing days. Batsmen like Brian Lara, Sachin Tendulkar, Ricky Ponting, Rahul Dravid, Kumar Sangakkara, Sanath Jayasuriya, Jack Kallis, and Adam Gilchrist gave nightmares to some of the most fearsome bowlers. Modern day cricket is no exception to that. Irrespective of the format, even the greatest bowlers got hammered on occasions and sometimes by the same batsman. At some point in their career, these bowling greats have talked about their batsman who tormented them the most. On that note, let's take a look at five current fast bowlers and their most feared batsman. Arguably the most consistent and fearsome fast bowler in world cricket at the moment, Kagiso Rabada has been phenomenal for South Africa over the past couple of years. Having made his international debut at the age of 19, Rabada has matured a lot as a bowler. The 23-year-old is one of the quickest to 150 wickets in Test match cricket. He has also picked up 93 wickets in just 57 One Day Internationals. In August 2018, Wisden named him the best young player in the world. 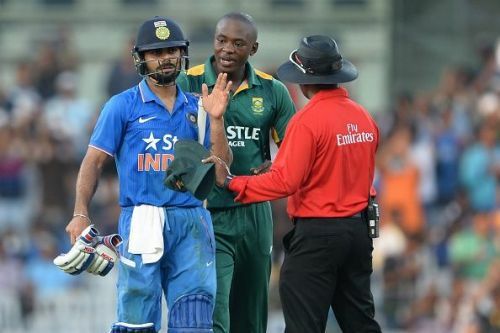 He has dominated some of the greatest batsmen in the world, but, not against Virat Kohli. The South African speedster has revealed that the Indian skipper is the toughest batsman he has ever bowled to in his career so far. The youngster has managed to dismiss the right-hander only twice in six Tests and twice in 11 ODIs.